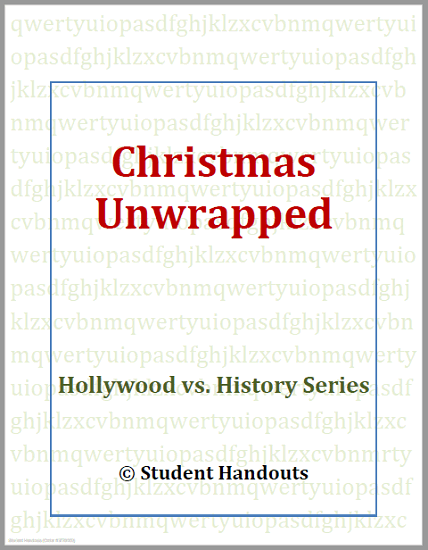 "History Unwrapped: The History of Christmas" has been a holiday favorite on the History Channel for many years now. It is 45 minutes in length and can be viewed for free online or on television in December, and is likewise available in libraries and media stores. This program focuses on the history of the holiday from ancient times through to the present. Traditions such as the Christmas tree and Yule log are traced to their pagan roots. The story is entertaining, and great for students aged 10 or older. Parents/Teachers might learn a thing or two, as well! The tone of this documentary film is secular/historical, making it "safe" for public schools and members of non-Christian faiths, while at the same time, the film is in no way controversial or unsettling for Christian viewers. It's a good watch for everyone. We are sure you'll enjoy watching it as much as we did. Our six-page booklet is designed to accompany a viewing of this program. It includes a word search "pre-viewing" activity, to introduce some of the vocabulary. The "viewing" activity involves taking notes on the major topics that are covered (listed in chronological order). The "post-viewing" activities include a recall matching quiz and two critical thinking essay questions. Click here to print. The answer key is below. The video can be purchased here.